From 6 years old to 11 years old : CP, CE1, CE2, CM1, CM2 (Year 2 to Year 6). 8 a.m. to 2.30 p.m from Monday to Friday. 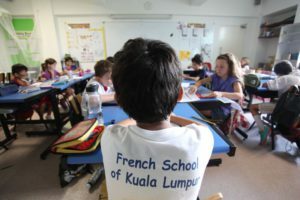 Except on WEDNESDAYS, classes end at 12.00 p.m.
it indicates annual benchmarks around which learning sequences in French and in Mathematics can be organized. It does, however, leave the choice of method and approach free:a sign of the confidence placed in teachers to adapt the curriculum to their students’ needs. In this context, the teachers offer support to all students, particularly those who encounter difficulties, by personalizing learning support, ensuring school success for everyone. The primary school curriculum specifies the content of core knowledge which all students must acquire. Regular evaluations by the teachers ensure assessment of the knowledge acquired by students and their level; they will contribute to the validation of the intermediary stages of the mastery of the Common Base of Knowledge and Skills. They are sent to the families and encourage useful dialogue to monitor the children’s schooling. The organization in cycles of several years ensures each student’s rhythm is taken into account. Studies are spread over twenty-four hours per week plus two additional hours for language learning, Monday morning to Friday afternoon. Two hours per week are set aside for personalized learning support for children encountering difficulties.